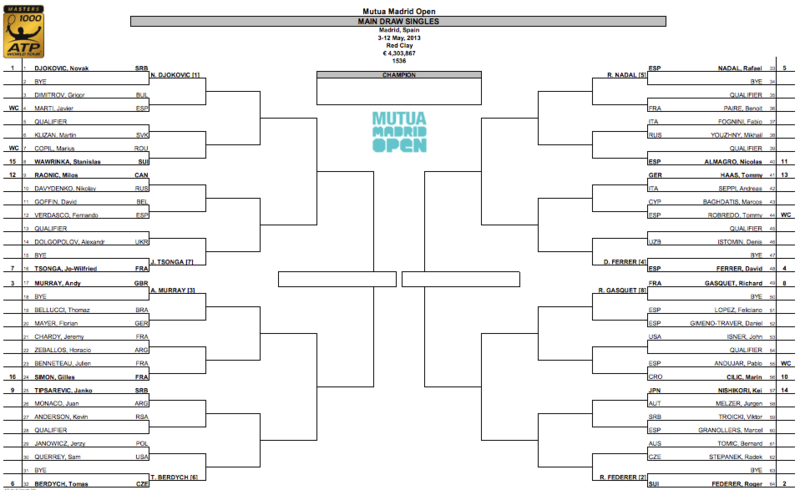 The draw for the 2013 Mutua Madrid Open was released Friday, with the clay masters event returning to red clay after its first and only year on blue clay. Roger Federer is ranked and seeded second, and returns to the Madrid masters as defending champion after nearly two months away from the tour. The Swiss maestro receives a first round bye, facing Bernard Tomic or Radek Stepanek in the second round. His projected match-ups from there on are Kei Nishikori in the third round followed by Richard Gasquet in the quarterfinals. Although David Ferrer is the seeded semifinal opponent, it is far likely that Rafael Nadal will be present in the semifinals. Leading the opposite half of the draw are Novak Djokovic and Andy Murray. See the full draw below. Main draw action begins Monday, May 6. See Roger Federer’s Nike outfit for the 2013 Madrid masters here. Watch full coverage of the Mutua Madrid Open on FF07tv.